Yes it’s true. 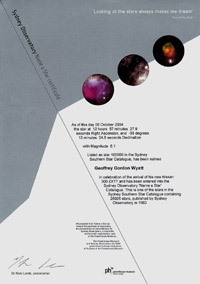 You can buy your very own star in The Sydney Observatory Name A Star program. You can’t take it home, but you can have it named after you. Or you might give it as a gift to a friend or perhaps as a way of remembering a loved one. Your star will be chosen from the Sydney Southern Star Catalogue and you’ll receive a star chart and the co-ordinates so you can easily locate your star in the night sky. With a magnitude of between 6 and 10, your star will be visible in the night sky from anywhere in Australia. You’ll also receive a certificate of authentication to frame and your chosen name will be officially entered into the Star Catalogue. Your Name a Star package also includes an evening pass for two so you can see your newly named star through a professional telescope. It takes five working days to prepare a Name a star package so on’t leave it to the last minute for a special occasion. The cost is $250 ($225 Powerhouse members) and the proceeds go to preserving and improving the Sydney Observatory which is a charitable not-for-profit organisation, part of the Powerhouse Museum.